In the past I have used the traditional curry comb and or a rubber mit. The smaller rubber curry is not the right shape to get areas of the horse's head and legs. The problem with the rubber mit is (for me at least) is that the mit is hard to get on the hand especially when wet. The rubber mits usually also split on the side. The HandsOn gloves are great for the body but also quite good for getting areas like the hocks and in between the tendons on the sides of the front legs. I also like the fact that they come in a pair and can get more areas at once while with the mit or the curry you can just use one. The one concern I had at first was cleaning them. This proved not to be a issue at all. When using them on a dry horse simply clap your hands together and the dirt and excess hair falls right off. On a wet horse or in the event that they get full of hair a quick rinse with the hose takes care of it and the gloves dry out quickly and can be used again. 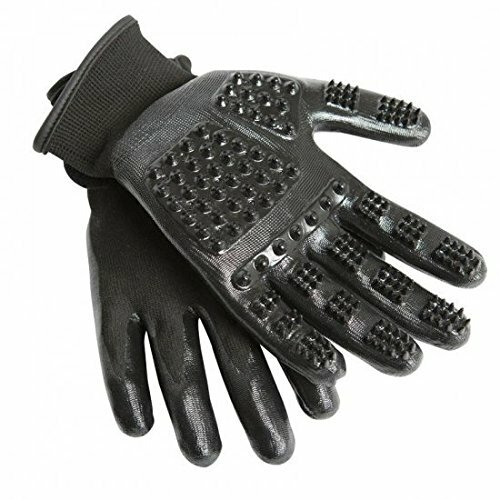 I would recommend the HandsOn Grooming Gloves to any horse owner (I also used them on my dogs with great results as well) I think they are a great addition to any grooming kit. Love the Weekender Tote !! For me as a horse person who also has a "real job" this bag is perfect for what I need. I commute a lot via train and I don't like leaving my riding boots or helmet at the farm. It's not only a good looking bag but also durable and stays clean. The other features that I like are the drawstring bag for my helmet (lost the helmet bag to my pricey hat awhile ago). The zip up/wallet style bag inside is good for my id and change etc. I like the size as it fits everything I want and is stylish and not bulky or awkward like the older style boot bags. Highly recommend this bag and would love to see other colour options as I would like another.